If you’ve been involved in an accident, you may be wondering what steps you should take. The car accident attorneys of Elk & Elk have compiled a checklist for anyone who has been in an accident. It includes 11 tips to follow and also provides space to take notes at the scene of the accident. We have five decades of experience helping accident victims. Let our experience help you if you are in an accident. 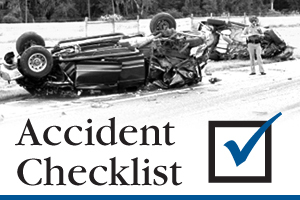 Download and print out this checklist and keep it in your glove compartment so you have it handy if you are ever in an accident.